At Funk/Levis, we are extremely passionate about education. When supporters of 4J Schools asked for our help creating a campaign to support a local levy, we were eager to take on the project. 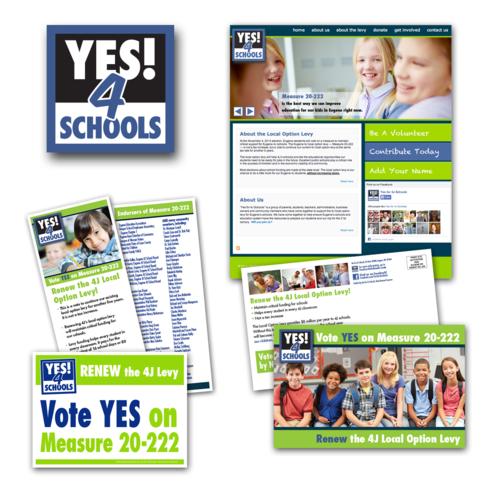 We created postcards, lawn signs, a website, fliers and more for the Yes for 4J Schools campaign. The campaign aimed to inspire parents to vote ‘yes’ on Measure 20-222, which would renew 4J’s local option levy and maintain critical funding for Eugene’s schools. Ballot measures come down to a central tenet of any strategic communications campaign: messaging. For ballot measure campaigns, we harness the power of a message in order to connect with audiences. Great messaging has a transformative power. It takes an idea, educates an audience and helps create change at the ballot box. To develop strong messaging, we must combine text and visual elements with the right delivery methods. With this in mind, we set out to donate our time and design an effective campaign for 4J Schools. The Yes for 4J Schools campaign integrates many elements found in most successful campaigns. Our design team created the campaign’s materials to be versatile and work well in different settings. The logo was made sufficiently large so that it could be used on signs at press events. The website was built to be simple, effective and engaging. Our priority was to provide facts, raise money for the campaign and help channel volunteers to the campaign. To augment our efforts, we used our public relations expertise to organize a media event that brought local leaders together in support of 4J Schools. The event, which took place outside one of the four district high schools, was featured by the Register-Guard and on TV through KVAL, KMTR and KEZI. In addition, extended radio interviews were set up to further drive messaging out to the voting public on news radio stations KPNW and KUGN. The local NPR station, KLCC, was also contacted personally to facilitate a story. This widespread publicity helped to raise awareness regarding the levy, providing excellent support for our overall campaign. Our team takes great pleasure in working on projects that allow us to demonstrate our commitment to local efforts. As dedicated advocates for quality education, we are proud to have been invited to work on a project as important as this one! Thanks for reading, and don’t forget to follow us on Twitter and like our Facebook page.